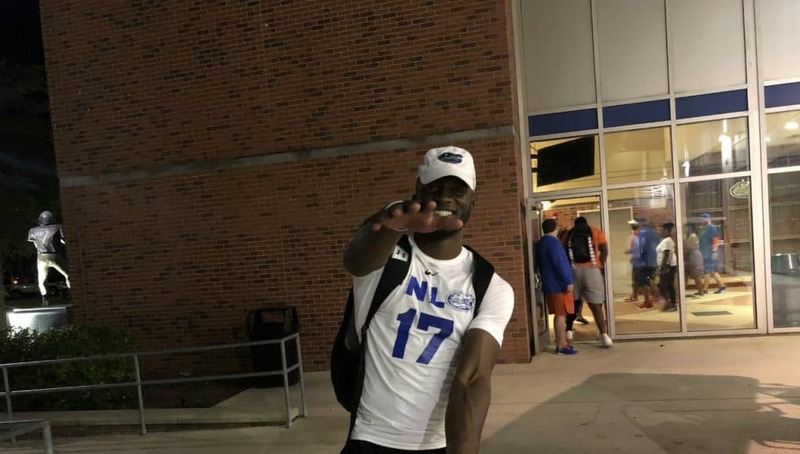 The Florida Gators recruiting efforts took a little hit on Saturday night after the loss to Kentucky but the staff still hosted a lot of prospects on campus. 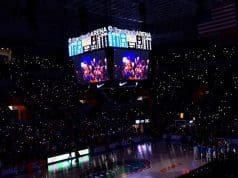 Florida has one more home game before heading out on the road for games and they will once again host guys on campus in hopes of gaining momentum. Tbod41: With injuries, transfers,etc, do you think there will be any change in the amount of spots for any positions in the 2019 Class? 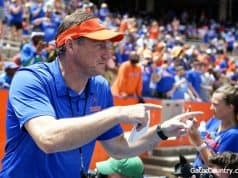 AS: Mullen and his staff are getting closer to being able to take a full class in 2019 and that’s something they would like to do in order to rebuild the roster the way they want it done. Polkgator: Do you think we get 2 running backs this year? Thanks in advance. AS: At this point I lean towards just one running back in the class unless both Nay’Quan Wright and Trey Sanders want in the class. If they both want in, then you take them both as both are really good players. Florida doesn’t have to reach for two in this class with the depth already on the roster. Alligatoralley: Why have we seemed to slip in Jax/NE Florida when we are the one school that can promise them a home game each year? What is it going to take for us to take back the Jax/NE Florida area? How did Miami establish such a foothold in Jax/NE Florida? AS: There’s not just one reason for that but several the first is simply Miami has out recruited Florida in the area and secondly Florida has made some choices not to take some guys in that area that Miami has taken which has cost Florida later on. Next year is a huge year for Florida to regain strength in that area as it’s a loaded class in 2020 with several guys leaning towards or speaking highly of Florida early on. Ron Duggans and Todd Hartley have both done a great job for Miami in that area and like I said above they’ve taken some questionable guys out there in order to get their name spreading through the area. GatorNavy: Are there any JUCO offensive linemen on our recruiting radar? AS: At this point only JUCO offensive lineman LaQuinston Sharp has an offer from the JUCO ranks but I would expect that to change. Ufgator84: Is there any hope for 1-2 more quality offensive line recruits, especially at least one tackle? AS: Right now there’s only room for one more offensive lineman in the class but that needs to be a tackle but right now the two top remaining targets on the board are guard. JUCO offensive lineman LaQuinston Sharp and offensive lineman Kamaar Bell. John Hevesy and the rest of the staff have to find another tackle to add to the board as Wardrick Wilson is the only true tackle in the class with William Harrod saying he will start at guard and then move to tackle. Ufgator84: Is there any hope for 1-2 stud safety commits? How is it going with Lewis Cine? Any quality safety recruit HAS to see immediate playing time, right? AS: Jordan Battle, Lewis Cine, Aaron Beasley and Cortez Andrews are all on the board at safety but I don’t see two of them committing. I do however think that Florida will get at least one safety in the class as they see a huge need there. As far things going with Cine, he’s playing to visit for the LSU game and he’s constantly talked up Florida but the Gators do trail Georgia heading into the visit. AS: Jalon Jones, Mohamoud Diabate, William Harrod, Wardrick Wilson, Ethan White and Jaydon Hill are all commits that say they plan to early enroll. As far as targets go Lloyd Summerall and Trey Sanders are the only two who have said for sure they plan to early enroll. This always changes though so while this list is accurate today, in a month it may change completely. Ol2ange: Based on your information today, how many players do you expect to transfer from Florida after this season ? You don’t have to list any names, but a number would be good (and / or position). AS: I don’t have an exact number but transfers always happen after year one under a new coach and honestly transfers happen every year no matter the coaching staff. There are some guys who will see they aren’t playing much or aren’t a fit in the program and will move on. KHC_Dad: Right now, my two biggest concerns this cycle are with safety and offensive line. I know all of these guys are committed or leaning else where, but are we still recruiting Evan Neal, Keiondre Jones, Dontae Lucas, Tyrique Stevenson, Nick Cross, Brendan Gant, and Jordan Battle? AS: Florida is still recruiting all of them with the exception of Brendan Gant. Those guys are still listening to the staff but right now the only guy who has said he plans to visit Ohio State safety commit Jordan Battle who says he wants to come up for a game this fall. Juggernautz: Which recruit do you think will have the biggest impact of the current class? AS: If he qualifies it could be Diwun Black but if for some reason he doesn’t then I would say Mohamoud Diabate or one of the corners simply because of the depth issue at the position. Diabate is a guy however that should come in and get on the field in pass rush situations as he’s already ready for college football. 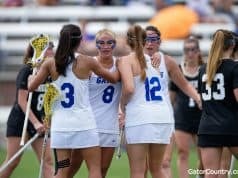 Gatordon: Because some top recruits are in a wait and see mode, how much damage did the Kentucky game do? AS: One game doesn’t define recruiting and doesn’t hurt things much, it did halt momentum some but that can be regained with wins in the coming weeks. Recruits want to see how the offense and defense is being run and such.